Shelby White: "it’s not as though she is hiding anything"
Back in 2006 Frances Marzio, a curator at the Museum of Fine Arts in Houston, was interviewed for The New York Observer (Jason Horowitz, "How Hot Vase It? ", February 19, 2006). 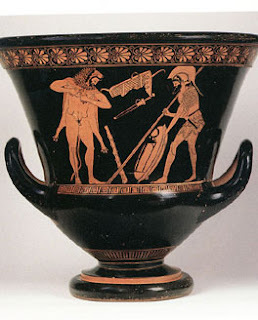 The context was the investigation by Italian authorities into objects in the Shelby White collection including an Attic red-figured calyx-krater attributed to the Eucharides painter. The krater is one of several objects named some time ago in documents obtained by The New York Observer, in which Italian prosecutors charge that several key treasures in Ms. Shelby’s collection were mined illegally from Italian soil. He would not specify which new pieces in Ms. White’s collection were coming under scrutiny as a result of the Aboutaam evidence. How did Shelby White respond back in 2006? Let me put it this way: We bought in good faith, we published everything, we supported archeology, and we supported conservation ... We acted in good faith, and if we did anything wrong, I am prepared to address that. What we now know is that at the time a bronze krater was on loan from Shelby White to Houston. it’s not as though she is hiding anything. I want to be helpful. So there is nothing to hide and Shelby White wants to be helpful. Please could the collecting history for the bronze krater in Houston be disclosed? The poll has shown that vast majority of this blog readers would like to know the history of the Shelby White bronze krater (The Koreschnica Krater) on loan to the MFA in Houston. The results are representative for the view of the informed public in general and as such should be presented to the MFA in Houston (and maybe to Shelby White?). The MFA in Houston, or any museum for that matter, can not ignore the view of the public when its very existence is based upon that public and aimed at serving the same. It would be very informative to know where MFA stands on this poll. A no reply would be just repeated confirmation of scraping the AAMD Guidelines and choosing to serve private interests instead (those of Shelby White in this case). For background on how deep and enduring Shelby White's privileges are, see "Statues of Limitations" The Village Voice, August 22nd, 2000. Shelby's interlocking within the Academia is especially intriguing, knowing that she holds no degree in any related field. Thank you for these comments and link to The Village Voice. Hillary Rodham Clinton's comments on the "Weary Herakles" are very relevant. See comments by Janice Berg at "Up For Grabs". As the public pressure upon MFAH mounts, the curatorial staff there will need rethink their position and adjust the museum’s loan acceptance and disclosure policies, as well as start cooperating with their colleagues. "Borrowing trouble / Long-term loans don't let museums off the hook" is back on-line.